It was a few years ago I saw the Roving Crows now. I remember in Bromsgrove. Not far from Ledbury (their home turf) andalso not far from where I spent my youngest years (in Kidderminster); it was an interesting experience when I was relatively new to folk. It was not just an introduction to the band and the genre but also the Artrix, a venue that looked like it had descended from space. Modern with sleek edges, its appearance did not match my initial thoughts and with it I brought home a new interest that had developed far away. This was a surprise.Another surprise is Roving Crows’ new album “Bury Me Naked”. I liked the Roving Crows when I saw them but I can’t say I loved them. However, coming one full circle (with many more to go) I can see now that their new album (along with their music) reminds me that social and environmental issues can be “rocked” and “jammed”in music as much as quieter acoustic numbers in the corner of a pub and still be polished and interesting. And so a change of heart has taken place. “Bury Me Naked” is a fun album. It doesn’t just stick to folk, it goes on a whirlwind tour of pop, rock, and reggae blending it together in an attractive package. There is a mix inside the packaging too. I like the rather earthy photography within the album sleeve; bright and bold it is a contrast to the sharp dark lines and concert photography across the front of the album. It is almost telling you that they are live performers first of all with a hat tip to the social causes they are supporting with their music and tour (drinking eco-friendly water, recycling and vegetarianism). When listening to the album along the way these themes do explicitly rise on the disc. “Refugees”, “Revolution” and “human Regret” you could say the three R’s. The title track of the album “Bury Me Naked” is great folk rock. After the introduction segment of the song, it really gets going, punching the air as it continues. The fiddle ambushes from the side and an early listen to O’Neill’s voice is smooth and spectral giving it a slightly otherworldly feel. Instrument-wide there is a nice variety between the drums and wooden percussion (Tim Downes-Hall) that scatters down the tracks like the softer patter of a wolf. There is also a bit of menace from the electric guitar as the singer croons, “you said love was a weakness, you’ve got me on my knees.” Taking influence from Native Americans and their suffering it sounds like a scene on prairie land with nature and wildlife all around. It is quite interesting, it changes pace as it casts it’s entrancing spell; it has an epic Celtic Rock spirituality with it’s reverb and hefty backing sound. The same atmosphere calls over to track 2, “New York Love Song” except of course more suburban and with a greater interplay between singers Paul O’Neill and Caitlin Barrett in the vocal department. “Refugee” is reggae. It doesn’t disguise this, it just is. Sometimes the best things in life are clear and straight and it works a treat here where opulent drums meet with an unabashed fiddle. Being uplifting and a part of a time in history that is still dealing with refugee affairs and how they impact on society, it does stand out as being different to the rest of the current crop of songs about refugees with it’s more sunny outlook. This might bother some people but not me. It does kind of appear from nowhere, you don’t automatically expect reggae but there is a cold place in your heart if the upbeat “sail away.. war-torn refuge.. world does not understand me” rhyming scheme does not put a smile on your face. With a great harmony (the best harmony) on the disc and exquisite fiddle from Caitlin Barrett (as always) it is more than a great addition. “Passing on the Love” is similarly like an Irish Coffee and a Bahama Mama being spilt together by the waiter in this joyous Caribbean mashup. Later on it descends into a kind of Celtic Dancehall track you could do some ska stomping to, it all civilised though and is a treat. “If I had to choose” is an example of a standout track from the album’s which appeals to a slower, more considered melody. Paul O’Neill sounds at his best and the instruments blend together for a lyrically short, but expansive feeling piece of penultimate entertainment with lines such as, “If I may be so bold; all that glitters is not gold.” It’s rock sound appeals more to me than the more monologue sounding “The Last Breath”, though the latter does carry some beauty with it. Quite distinctly introspective when the track comes on the album it is like that moment you drop a needle on an old Blues record and await the the searching intake of breath before the evocative lyrics. As previously mentioned the identifiable sound spiritual Rock permeates through many of the tracks here. With this we don’t get the same kind of feeling of remembrance you find in a lot of folk music where a story is told, the moral is clear (or hazy) and we never forget what has happened. Instead much of their sound is like an echo of a unifying cosmic energy that people can approach and understand on their own terms. It all comes to a head with their working of an old folk staple “Ride On”, the final track on the disc. It is large scale, it is quite resounding and heart-pounding and the arrangement brings a lot, burning an impression like an Eastern Desert’s winds on your face. Barrett captures the ballad sensibility well, wearing influences of alt-rock and dare I say, a quiet grunge in her consistent vocal performance that rises and falls delightfully. One of my favourites, it demonstrates that Roving Crows are not just a band striving for identikit energy tracks that you cannot distinguish on an album, but instead considering fast and slow, thoughtful and energetic in equal measure. 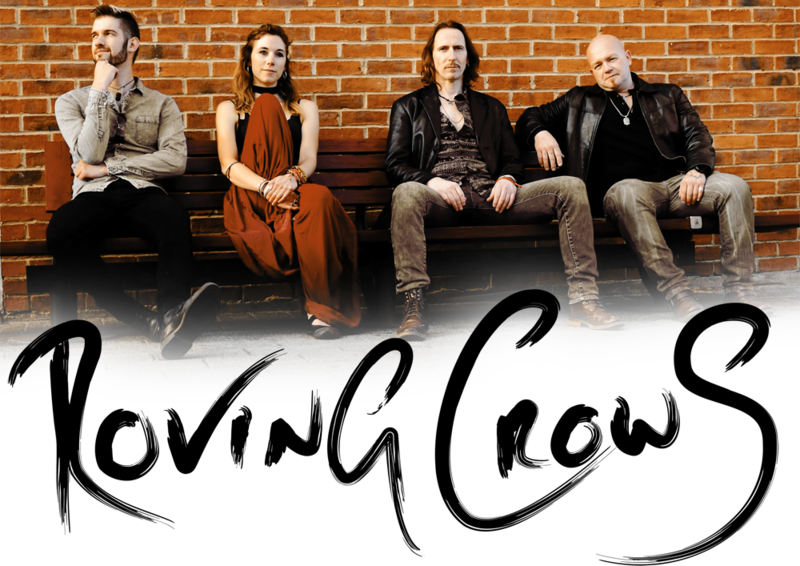 A nice mix of genre and with an spirituality and concern for the world, the Roving Crows set out and have a good time with it, which many would consider contradictory. But it’s not, they entertain and achieve buckets and buckets of likeability along the way. There is also a good range of tracks with some being more about melody and others more about the words. Jovial and wide-reaching in scope the quality of the music production is second to none. There has certainly been a progression. More importantly for me, they have dragged me out of the chair, unfolded my arms and invited me to dance. 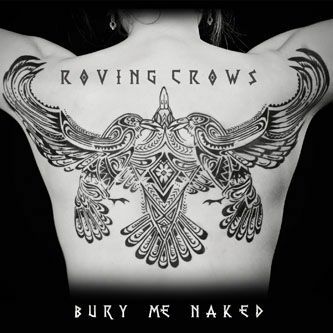 The Roving Crows are on tour and “Bury me Naked” is now for sale.